Excessive handbrake lever travel on late Ruby Saloons, where the hand brake moves nearly full travel even if the brakes are in good adjustment, is usually caused by the diameter of the wheel that touches the actuating lever on the cross shaft. Remove the hand brake lever assembly, remove the wheel and replace it with five, 1” diameter plain washers with a 5/16" hole. In most cases this will remove the free play completely. 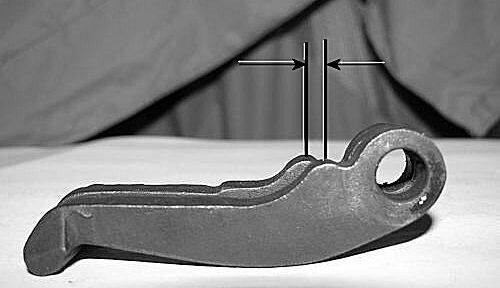 When re-fitting pistons—confused about the thrust side? Always re-fit pistons with the split skirt nearest the camshaft—sorted! If you’ve lost oil pressure after a service and have tried all the obvious culprits – pump, drive gear, woodruff key, pressure relief valve and pressure gauge, here’s one you may not think of. There are 2 types of rear camshaft bushes! If you fit the wrong one for your crankcase, you can finish up with no oil pressure. So check the rear bush to ensure it is a good running fit on the camshaft and a close fit within the crankcase avoiding oil by-passing the bush altogether. For 3-bearing engines, check the oil feed pipe to the centre main is seated well and not fractured. Got charging problems on the Summer circuit? 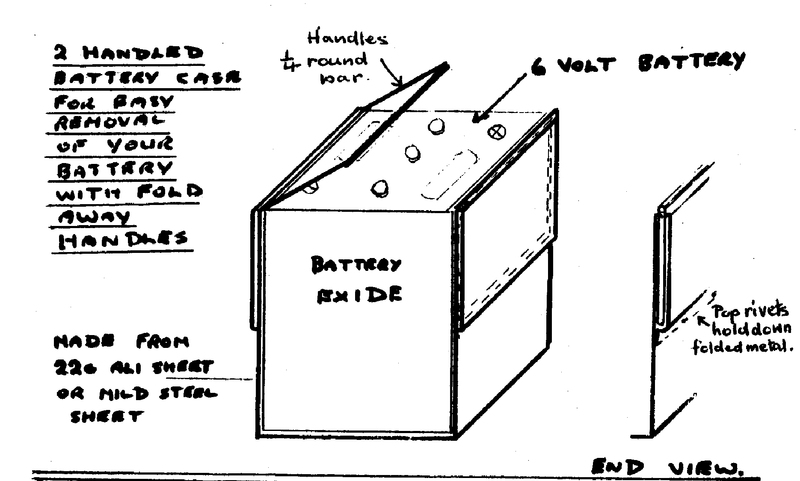 Just remove the cut-out assembly; drill off the back cover, exposing two coils; either one or both will have disintegrated. Either replace with 2-ohm wire or shorten and re-fit. Problem solved!! The first warning I had of trouble was the engine cutting out while hurtling down a hill. Then the engine cut out completely while running at full chat. Removal of the float chamber showed it to be empty. While exhibiting at the rally with the bonnet open someone must have operated the manual priming lever on the AC T-type petrol pump. The lever had stuck. This meant each stroke of the pump delivered a reduced volume of petrol. The car ran perfectly for miles and it was only when driven hard that the restricted petrol supply manifested itself. A few strokes of the priming lever making sure it was left fully down and we were away again. Examination of the pump showed the priming lever’s arms to be binding on the external spring which is meant to return it. Two bright spots on the spring showed it must have been happening for some time. Slightly widening the legs of the lever allowed it to miss the spring, the lever moving up and down freely. Many of our cars will have the T-type pump and could be at risk. I suppose the problem is most likely to be at the start of the season if the car has been standing. I understand the alternative M-type pump doesn’t have a priming lever. Essex A7C with thanks. I have twice had starter switches (Ruby type) catch fire because dirt trapped inside them combined with oil (the starter is just below the filler cap) has caused an internal short circuit in the switch. Check yours by flicking the switch lever backwards and forwards and sideways to see if it sparks. To rectify any problems dismantle and clean. Probably the worst disaster that can happen on your engine is to have a gudgeon pin clamp bolt work loose and come out. On its way out it will probably bend the con rod, score the bore and break the piston. It will drop on the gauze filter, be picked up by the crankshaft and smash a star-like crack in the side of the crankcase. The answer to this is not to use locking tabs but to ensure that you have new high tensile bolts fitted with spring washers and do them up really tight using ‘Loctite’ etc. on perfectly clean threads. Jack French recommends turning the little oil jets that squirt oil down onto the troughs in the crankshaft 20deg towards the crank centre-line (Mike Forrest says 30 deg, so take your choice!) to increase the period during which the oil is squirting into the troughs. I use a piece of hollow rod which fits over the jet and bend it slowly. First clean up the ends of the jets where previous owners will have walloped them trying to remove the crank and after a gentle bending, test them by inserting a suitable piece of thin straight wire to check alignment. Whilst travelling some 1300 miles over some terrible Irish roads recently, the only minor incident we had with the Austin was a solder fracture where the fuel pipe olive joins the pump. Not having solder and a blow lamp to hand, I cleaned the joint up, ensured it was dry and mixed up a little araldite. This was wiped over the olive and pipe covering the crack and left overnight. We are still driving about like this some 1500 miles later! To avoid cracking solder when undoing the pipe from the pump, always use two spanners, one to hold the union tight in the pump and one to loosen the pipe nut. 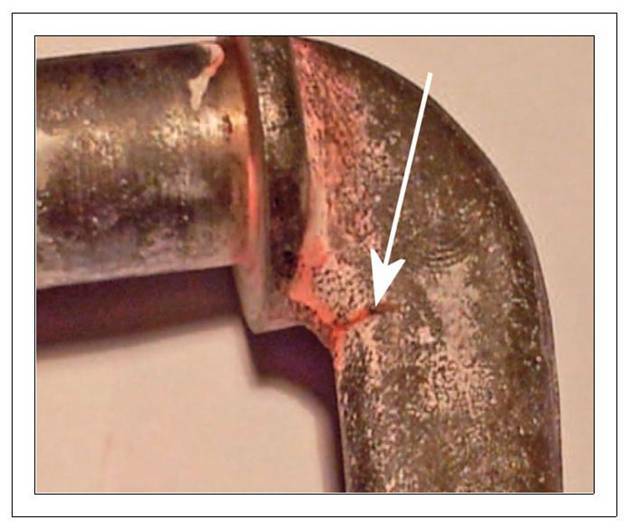 Sod’s Law says that if you use just one spanner to loosen the pipe, the union undoes instead of the nut, twisting the pipe and breaking the solder joint! When replacing the window felts in the runners’ channels, it is quite normal at first for the windows to bind and not slide smoothly up and down. If this happens, use French chalk or talcum powder but NEVER use any oil-based product including oil itself. 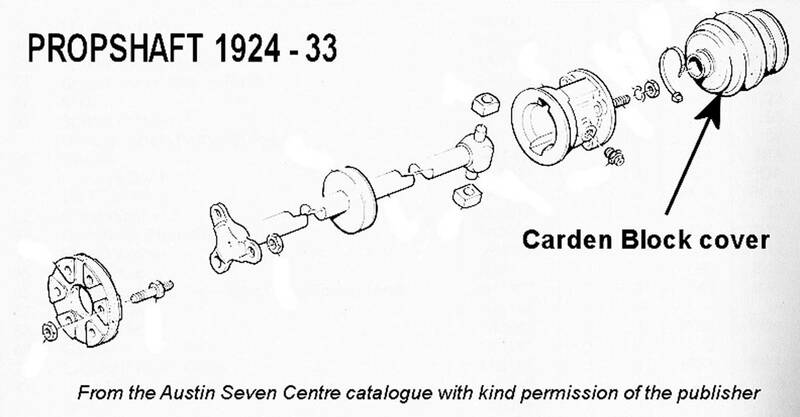 The difficulty in operating the window of an Austin Seven may be due to the moulding rail inside the door being slightly bent to put pressure on the glass. By resetting it the trouble with the window should be overcome. Also examine the channels on either side of the window in which the glass rises. These may be binding to make the action of the window stiff. If they are opened slightly and a trace of thick grease applied in the bed of each channel the stiffness should be eased. 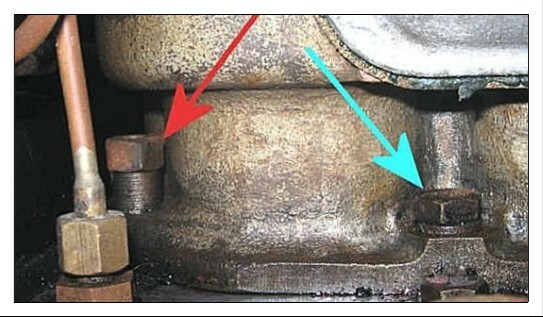 If attention to these two points fails to correct the trouble, the winding mechanism may be at fault due to rust resulting from the intrusion of moisture. Access to this mechanism necessitates removing the winding handle, which can be detached by levering the small spring catch behind the handle away from the spindle with which it engages. A loop of wire is sometimes useful for doing this. The waist-line moulding inside the door and the door catch are both held by screws which are quite easily removed, and the panel itself, which is held by screws or panel pins, can be prised away from the door. The winding mechanism can then be examined and thoroughly greased to render its action quite free. From the Austin Magazine. If the summer ‘half charge’ switch doesn’t seem to work, look around for two resister coils—2 coils of wire about 1.5“ long and 0.5“ dia. connected together at each end. They will either be on top of the dynamo with a fuse or as part of the cut-out on the bulk head. Sometimes, a bodge has been perpetrated by connecting the two terminals on the dynamo with a piece of metal. For cleaning the waterways you can use a mild acid as found in brick cleaner or patio cleaners found at builders merchants. To keep your windscreen clear in frosty weather and to help your windscreen wiper in the snow, lift the offside of the bonnet and, using a wedge or piece of card between the bonnet and scuttle and close the bonnet again. You will now have a small gap which will let the hot air from the engine keep your windscreen warm! As well as carrying a spade, candle and a box of matches (as recommended by the RAC) it is well to carry a couple of lengths of rope. You can use these as snow chains by wrapping them around your tyres and rims. My wife keeps her legs warm in the Seven by filling a plastic bottle with hot water and placing it on the floor in front of the seat and behind her legs. We find a one gallon container stays warm for about 1½ hours. A plastic one gallon container filled with grit can be sprinkled on snow and icy ground. A must for any motorist! 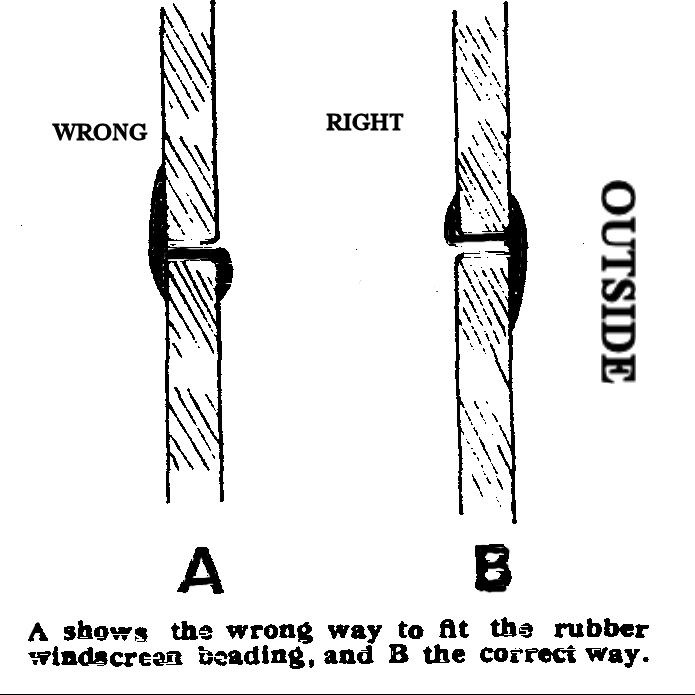 When adjusting Austin 7 cable brakes (on cars with coupled brakes) with all 4 wheels jacked off the ground, have a mate apply medium pressure to the brake pedal, or if all your mates are down the pub, wedge a block of wood between the seat and the pedal, and test the resistance on each wheel. It is most important that the brakes are tested from the footbrake rather than the handbrake, as the latter acts on the centre of the cross-shaft rather than from the offside end. The difference being the handbrake won’t pull and twist the shaft, especially if the brakes are worn, in the same way as when the pedal is used in normal road conditions. As you all know the cables should be adjusted so that the front brakes come on slightly in advance of the rear and the near­side rear should under light pedal pressure come on slightly more than the offside rear, so that under heavier pressure as the cross-shaft moves they equal themselves up. Having successfully adjusted the cables, go for a test drive and join your mates down the pub to celebrate. This is a good time of the year to clean up your king pins. 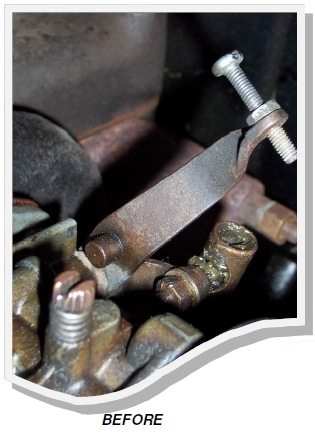 Removing the king pins once or twice a year gives you a chance to check that grease is getting down to the bottom bush and cleaning out the salt and grot from winter motoring will ensure that when the time comes to renew your pins and bushes, the pins are not irrevocably stuck in the front axle beam. This makes changing the king pins a nice easy job instead of having to dismantle half the car and take the whole front axle to your local blacksmith. A 12v regulator is readily available from a Morris Oxford or Austin Cambridge and the following changes have to be made: a 12v battery, all bulbs to 12v, new 12v coil and a 20-30 ohm resistor for the fuel gauge. In addition, I have found that Cibie lamp units from a Renault 4 give excellent lighting whilst looking better than the reverse taper rims needed to fit Lucas 700 units. Forming your own centrifugal weight springs can be achieved from a readily available open 3/16” spring. Slide it on to a 3/32” drill or similar (nail? ), gently heat with a blow torch until a dull red, squeeze up the spring until closed and sparingly spray with water to cool i.e. - not too quickly. Cut to a suitable length, make off the ends and fit. It does take a bit of patience, but it works! In an A7 Chummy, install an additional bulkhead forward of the fuel tank to affix any extraneous new fittings such turn-indicator units, additional fuses etc. (I find screwing these directly to the existing bulkhead severely worsened my fuel consumption and gives rise to an awful petrol smell!) Make the new bulkhead of good quality ply. However, the base of the contact breaker unit needs to be earthed as wood isn’t the best electrical conductor. If you’ve tried undoing the nut on the pinion inside the torque tube to remove the bearings, you will know how difficult it can be. 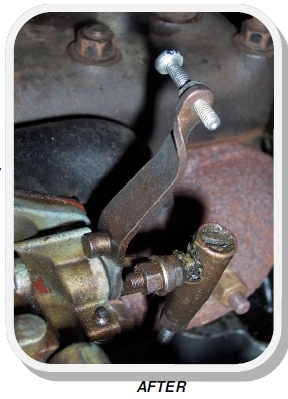 Not only have you to remember that the nut is usually a left hand thread but usually it will not budge no matter how much effort you apply to the spanner. To overcome this problem place the pinion in a wide vice as close to the nut a possible and tighten as much as you can. Heat the nut quickly and as much as you can without heating the pinion unduly. Then quickly apply a chisel to the corner of the nut and give it a hard hit with the hammer. “One hard hit is worth a thousand soft ones”. When removing A7 low compression, 18mm, cylinder heads, to save hammering a screwdriver or chisel between the joint, try using the hook end of a Ruby boot key into the plug holes of numbers 1 and 4 alternately. Even better, get 2 boot keys and make it even easier. This dodge does not work for 14mm heads. When you have put a new spring in your drag link it is always difficult to compress the retaining cup to get in the 1/4 BSF bolt to hold it all together. I use an old screwdriver which is about 3/16 diameter with its tip ground to a conical point. This can then be used to enter the bottom of the bolt hole and then levered across to locate the bolt entering from the top. Make sure the bolt has a radius-ed end so that it enters each part of the assembly easily - having said that you will still need to give it a gentle tap to overcome the spring once it is far enough engaged and you remove the screwdriver. You know the problem: a saw-cut needs to be made or a hole drilled in a particular place where the light is not good and the metal is inevitably blackish or black-painted. Identify the general area for the cut or hole, place a piece of ordinary masking tape on it, mark the line or spot with a black ball-point or dark pencil, do the job, and pull off the tape – hey presto, job done and no unsightly marks left on your little beauty! Before undoing the timing gears, remove the fuel pump entirely from the crankcase and don’t replace it until after the new gears have been firmly installed. If you don’t do this, the camshaft may move backwards once the timing gears have been removed allowing the petrol pump cam-follower (lever-thing) to slip to one side of the pump-drive cam and jam things up! Even after re-fitting the pump it will be judicious to check things are where they ought to be by gently turning the crank by hand. If the cam follower has been displaced, a firm ‘clunk’ can be felt as the crank hits the obstruction. If you’ve tried undoing the nut on the pinion inside the torque tube to remove the bearings, you will know how difficult it can be. Remembering that the nut is usually a left hand thread, place the pinion in a wide vice as close to the nut as possible and tighten as much as you can. Heat the nut quickly and as much as you can without heating the pinion unduly. Then quickly apply a chisel to the corner of the nut and give it a hard hit with the hammer. “One hard hit is worth a thousand soft ones”. And hey presto, you’ll almost certainly find the nut has moved. To release the large aluminium pulley at the end of the camshaft, hit it sharply sideways against the edge of one of the holes so as to try to rotate the pulley on its shaft rather than trying to hit it from behind along the length of its shaft. Morris Minor brake cylinder adjusters can be reversed so that the screwdriver slot faces the back plate. Drilling the appropriate hole would allow adjustment from the rear. The hole needs to be 3/8" as the adjuster changes position as it is adjusted and you also need to cover the hole as well to keep water out. All this means that by drilling a couple of carefully aligned holes in the back plate it saves all that hassle of drilling the cast iron brake drums and removing the wheels every time you want to adjust your brakes. If new brake cams have a sharp edge where they push against the brake shoe, it must be rounded off. Also, look for a groove that may have been worn in the old brake shoe by previous cams. Should your brakes lock-on, it may be that the cam has lodged underneath the groove. In which case, drive the car in the opposite direction and it should release. In a worst case, a plate can be attached to the end of the brake shoe to remove the groove. When using an RCD safety adapter, which you should always use with power tools, it is most important that you plug it as close to the tool as possible. I.e. if you are using a 100 foot extension lead, put the protector at the power tool plug, not at the mains supply at the start of the extension lead. The reason being that if you put it too far from the tool, electrically speaking, the delay due to the resistance and voltage drop down the extension cable, may well prevent a vital trip out in the event of an accident. Another tip, if using an extension cable reel, you must fully unwind it from the drum, before use, otherwise the coiled up cable will act as a resistor and cause voltage drop, and will result in the cable heating up and at worst catching fire. As the input shaft bearing of an Austin 7 3-speed gearbox wears, the oil returning quick thread gets damaged in the nose piece, allowing oil to leak onto the clutch. A simple and cheap way to overcome this problem is, firstly, to renew the bearing and then insert a modern oil seal in the nose piece between the input bearing housing and the roller bearing. This stops oil from reaching the worn quick thread. There are 2 types of seal: either Payen NA080 or Payen NA092 will do the job and they are simply a press fit in the housing, It is a good idea to grease the new bearing as hopefully no oil should now reach it. I had just completed rebuilding a Chummy some years ago and went on a maiden voyage to club night. I filled the tank and set off. Immediately after braking for a roundabout, the engine compartment burst into flames. Luckily, a passing motorist phoned the Fire Brigade and it was put out, but not before destroying the loom and taking the paint off the bonnet and scuttle. Observations: Do not over-fill the tank, ensure you have a good fuel tight seal on the cap with a screw cap, not the bayonet type, similar to the oil filler which presents more of a challenge. Also fit plastic HT plug tops and discarded the bare brass type which are asking to cause a fire if fuel is splashed on them, non original I know, but ...... Finally ALWAYS carry a good and functioning fire extinguisher with you. Negative Earth cars: the negative tab on the coil (-) goes to the distributor/contact breaker. The positive tab (+) goes to the battery (+) via the ignition switch. Positive Earth cars: the positive tab on the coil (+) goes to the distributor/contact breaker. The negative tab (-) goes to the battery (-) via the ignition switch. On older coils with SW and CB marks, rather than + or -, one cannot tell what car they were originally designed for and so the following flow test can be performed with a sharp, soft pencil (if you are brave enough and not fitted with a pace-maker! ): With the engine running, disconnect a plug lead from the top its plug and hold the end of the lead about 1 cm away from the top of the plug so that it makes as long a spark across the gap as possible. Introduce the tip of the pencil into the electrical stream. The ‘lead’ of the pencil will be seen disintegrating and blowing away in the direction of the electrical stream which should be towards the plug top. However, it is probably safer to go out and buy a modern coil! The Ruby flexible petrol filler hose is an exact match to FORD part number 1416973. It is often difficult to remove rust from small, intricate parts but the following electrical process works well: Ingredients:- plastic container, a piece of lead, a handful of salt or bicarbonate of soda and a direct current source of electricity. This can be provided directly from a car battery or through a battery charger. Thoroughly dissolve the salt or bicarb in a quantity of water. 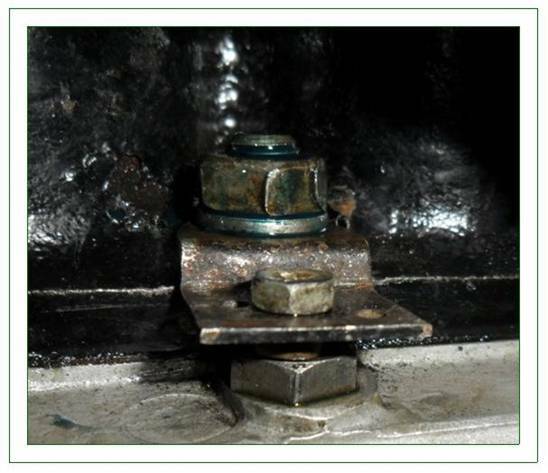 The rusty article is attached to the negative terminal, the piece of lead to the positive terminal and both are then immersed in the solution making sure that the two metals do not touch one another. Turn on the power supply and watch the bubbles rise. These bubbles are hydrogen and oxygen and both are highly explosive. Do not carry out this operation in an enclosed space! The hydrogen takes oxygen from the rust leaving a loose sludge that can be washed away, probably needing a wire brush, before applying a primer. The time taken depends on the area and thickness of the rust and the amperage used with heavy encrustments taking several hours. After a time, the lead will become coated with a sludge which, if left, becomes a hard deposit and so should be cleaned from time to time. The article is unaffected but, if left in the salt solution for too long would soon be attacked. The solution becomes rusty and muddied but, as long as bubbles appear, the process will continue to work. With many thanks to Phil Allman from the Isle of Wight Austins Club. Engine oil diluted with paraffin is perfectly suitable for the lubrication of leaf-type road springs and it is widely used for this purpose. The springs should be thoroughly cleaned by scraping and brushing, then the car should be jacked under the chassis so that the springs are opened as much as possible. The diluted oil can then be sprayed or brushed on. The mixture is just as good as penetrating oil and considerably cheaper. No particular degree of dilution is recommended but a half-and-half mixture will serve admirably. If you have a fuel supply problem check the fuel-feed needle valve assembly from the underside of the fuel chamber lid, it might have a speck of debris trapped in it giving an intermittent feed. A small flat rotary wire brush that just fits inside the distributor cap will clean all four contacts and the carbon brush in a trice. On the coil there are terminals usually marked CB and SW in Lucas sets. These are connected to the contact breaker and to the switch respectively. Even if they are not marked in this way they can be recognized by their obviously low-tension cables. The lamp bulb can be connected in two ways. One is to insert it in series with the coil. For that purpose the cable from either of these two terminals must be disconnected and attached to one terminal of a lamp holder or adaptor, obtainable at any electricians or at some of the sixpenny stores. The other terminal of the adaptor must be connected to the empty terminal of the coil. In this method there may be only a feeble glow from the lamp because its resistance is added to that of the coil and therefore only a small current will flow. However, the light will usually be quite discernible and so soon as it disappears one knows that the contacts have separated. By an alternative method it is possible to obtain the same result, but with a brighter light and without undoing a single terminal. In this case the bulb is placed in parallel with the coil. That is to say, the terminals of the lamp holder are connected to the two terminals on the coil. All that one needs for that purpose are two short pieces of stiff wire, attached one to each lamp terminal so that they can be "touched" on to the two coil terminals while the engine is cranked gently round. To get the exact point of ''break" the final movement of the crankshaft can be made very conveniently by turning the fan pulley backwards or forwards. A suitable bulb for use in this case as in the other can be taken from a sidelamp of the car. There is thus remarkably little expense in rigging up this useful apparatus. For those who may indulge frequently in ignition-timing experiments, it is well worth having, and another even cheaper device to go with it is a mark on the lower fan-belt pulley to show when No. 1 piston is at top dead centre. Frequently there is such a mark on the flywheel, but it will avoid repeated removals of floorboards and/or clutch-pit cover if a T.D.C. 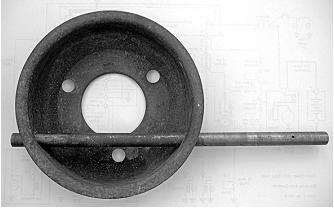 indicator is made at the other end of the crankshaft, where it can be seen without removing anything. Light Car Jan 1940. One of the most unreliable aspects of the 3 speed gearbox cars is the slotted collar clutch thrust bearing. The clutch levers have a nasty habit of wearing through the collar at the most awkward of moments, necessitating removal of the engine to restore the mess. Instead of re-cutting 3 new slots, a far more reliable alternative is to fit a 4 speed gearbox type clutch thrust, which simply slides on in its place. When the gearbox is bolted up to the engine, make sure there is clearance between the race and the levers and that when the pedal is depressed the clutch disengages fully. If not, bend the 3 levers with a long pipe accordingly. Once bent make sure all 3 are exactly the same distance from the centre plate to avoid premature wear and judder. The pedal rod end spring can now be dispensed with as there is no need to keep the race in constant contact with the levers as there was before. Mouse trap springs need not be fitted, nor the 4 speed box race return spring but, if preferred, the later wide foot clutch levers may be used. The above simple and unseen modification should result in a more reliable set up and a smoother clutch operation. Mine has been fitted for about 40,000 miles, so far without any problems. One way to prevent oil spilling (or dripping) onto the ignition wires and the starter motor etc., is to temporally extend the oil filler tube. I use a plastic Coke bottle with the bottom removed, the screwed top seems to just fit nicely into the top of the filler tube of my Box saloon and the ignition wires support the bottle too. Now I rarely spill any oil over the off side engine area. Sandy Croall (Cornwall A7C) with many thanks. If your door key, or any other key for that matter, is a bit 'sticky' in the lock, don't use oil to free it off, rub the key with a soft lead pencil. Most pencil leads are made from graphite, which is a great lubricant, with the added bonus that it will not attract dust and dirt like sticky oil will. You can also buy powdered graphite which can be 'puffed' into keyholes. You can also rub the pencil over the latch on your door, this will make it shut a lot easier. Lee Webster. Cornwall A7C with many thanks. To check the polarity of an A7 - Most Austin Sevens were originally negative earth but I have come across some that aren’t—perhaps they were changed over in the 60s when many ‘modern’ cars became positive earth to help prevent rusting (it was thought). To save doing any damage to your dynamo, or reversing its polarity by mistake, replace the battery with the normal negative going to earth, i.e. the body of the car, do not start the engine but switch on the headlights and look to see if the ammeter is showing a discharge. If it is showing a charge, then the cables are the wrong way round. However, the terminal posts on most batteries should be different sizes as should the connectors so you should also be able to tell when you try to refit the terminals to the battery. 1. Check the brake shoe pull-off springs. 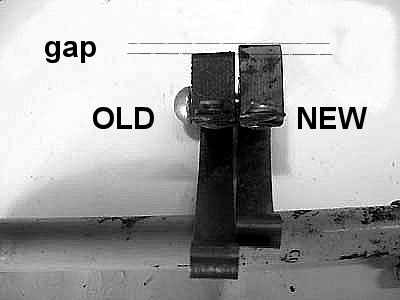 Replace elongated or miss-shaped springs with new. 2. When you have to reconnect the last brake shoe spring, loop a length of string through the spring hook, pull it tight and tie-off on something. Now push the spring in position around the hook on the brake shoe with a screwdriver. Release string. Remove string. Job done! 3. It is most important that the brake linings are not impregnated with grease, etc. Stick masking tape on the linings to protect them until the dirty work is done then just peel it off. 4. When you have replaced the brake linings you probably will not be able to get the brake drum on again. Remove any adjuster you have on the cable. If the drum still will not go on, slacken off the foot pedal adjusting screw. 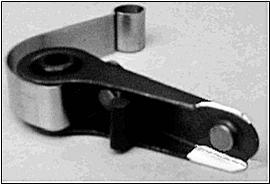 This allows the brake cross-shaft to turn back and allows the brake shoes to fully return to normal. Now the drum should go on. If not, bad luck! It means you have to slacken the clamp bolt in the brake cable forked end and pull the cable out a bit. Terrible job! Don't pull it right out as it is a so and so of a job to get it back into the forked end again! Austin Sevens have always been prone to catching fire. The main cause is the lethal mixture of oil and sparks which can occur together around the starter motor terminal. Oil can drip from the filler tube directly down onto the electrical terminal below and, should the securing nut become loose and a spark develop or the insulation becomes oil-soaked, the hot oil quickly ignites. On a less dramatic point, I have always been happier when putting Baby to bed, to know that everything electrical is disconnected and there is no danger of a nightmare developing unseen. The answer: to fit an isolator master switch in the main power lead from the battery. There are two sorts – a simple turn-key affair or the more sophisticated ‘Dis-Car-Net’ battery terminal extension, both available in all high street motor shops. For the Box, I chose the simple turn-key as the battery is underneath the driver’s seat and to operate the terminal switch would entail lifting the seat and the battery cover every time. The turn-key was fitted in the front panel of the driver’s seat mounting box and can be operated by simply reaching down and turning the key. Later cars with the battery under the bonnet can have the turn-key fitted through the bulkhead in line with the driver’s right knee picking up the main battery lead on its way down to the starter motor. The only tool I needed that might not be in everyone’s kit was a 2” metal hole-cutter but I saw one in In Excess the other day for £1:50! One final advantage, of course: switching off and taking the key with you is an excellent anti-theft device. I have had dreadful steering wander since putting the Box back on the road. I have repositioned the quadrant in the steering box, replaced both front bearings and played around with front/rear tyre pressures. But things just kept getting worse. The horrifying answer was a loose ball pin which connects the steering drop arm from the steering box to the drag link tube which goes from the drop arm to the offside front wheel steering arm. The split pin had disappeared and the ball pin was loose on its taper and on the point of coming out altogether! Answer—check the castellated nut is as hard on the taper as possible. Do you struggle filling your rear axle with that thick 140 oil? Do you keep saying I must get a proper pump? Well, Sandy Croall down in deepest Cornwall has passed on this oh so blindingly simple solution. Next time you go to an autojumble or event where cheap tools are sold, get an oil can like the one illustrated with a flexible plastic pipe attached. They are 'as cheap as chips'. Cut off the brass nozzle, (don't try and pump the oil with the nozzle attached it will take for ever), and hey presto, job done. Sandy says he painted the side AXLE OIL, and found that a tyre valve cap fits the end of the pipe to keep the oil clean. 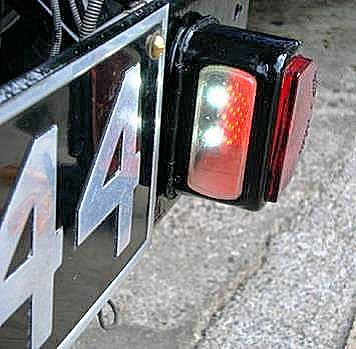 The headlamps fitted to 1932 Austin Seven saloon cars have special double - filament Lucas - Graves bulbs ; the main filament provides the normal driving beam, and the secondary filament, which is slightly in front of the main and is surrounded underneath by a shield, provides the deflected anti-dazzle beam on operating the switch on the steering column. 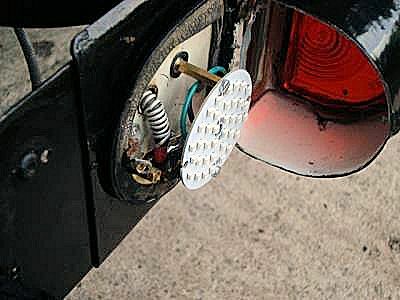 On these lamps the securing screw cannot be swung clear of the slotted plate at the base of the lamp, as is usual when releasing the lamp front, and any attempt at forcing this screw clear will only result in the reflector being dented from the inside. For removing these lamp fronts, it is necessary, after slackening the screw, carefully to prise off the front with a suitable tool and then, by swinging the top of the lamp front forward and downward, lift the slotted plate clear of the screw. Alternatively, the screw can be re-moved entirely, but if this is done, it must be ensured that the anchoring plate is not pushed away inside the lamp body, as this will necessitate dismounting the reflector before it can be reached. The correct Lucas-Graves bulbs can be obtained from any Austin dealer or Lucas Service Depot. From The Austi n Magazine. Have you inspected the rubbers on your shock absorber links lately? Being made of rubber they do tend to deteriorate over time and could be the cause of many problems such as erratic steering and poor cornering, check them out now.“Bumbling”, A7OC with many thanks. When did you last have a peek at the relationship betwix your ‘Seven’ hubs and shafts? Any sign of wear, marks on the key surface, sloppy fitting in the keyway are evidence of movement however small, between the shaft and hub, the cause more often than not being an insufficiently tightened nut. 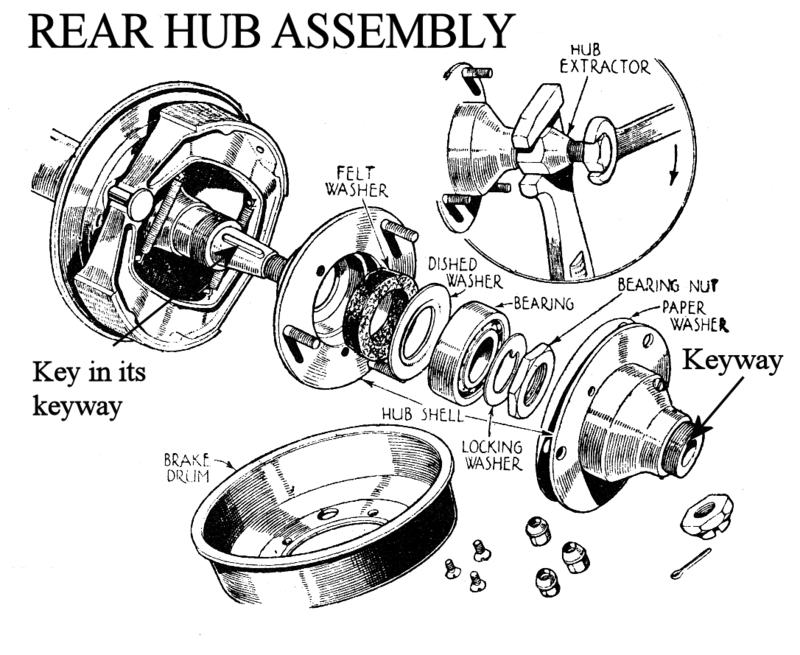 It may also be that the hub has been riding on top of the key. To check, remove key, fit hub and tighten nut as hard as possible with a socket and a substantial lever with a suitable length of bar placed between a wheel stud with wheel nut fitted (to prevent damage to thread) and the hub centre extending to the ground. Carefully note position of hub nut, i.e. marking face etc, remove nut, fit key if completely sound, and re tighten. Whatever else you do, do not fit a sloppy fitting key. Tightening to a different position indicates a need to file down the surface of the key until it tightens exactly to the position achieved without the key. Unless you’re fitting together the two components which have never previously met, proceed with caution down the road of ‘lapping’ the hub on to the shaft with grinding paste about which much has been written. After seven decades or more, it surely is reasonable to assume that any lapping that’s been needed, has already been done, who knows how many times. Over doing this lapping lark can only eventually lead to the risk of the nut tightening against the shoulder on the shaft beyond the threads, instead of against the hub. It is known to have happened! For additional confidence in a secure shaft/hub drive, the oft times repeated advice of re-checking the tightness of the hub nuts after a couple hundred miles or so is worth considering. And at the risk of stating the obvious, if, on the final tighten-up, you find that the cotter pin hole is not lined up to enable fitting the cotter; resist any temptation to slacken off to accommodate it, no matter how little. Either fit a suitable shim washer or grind down the nut surface just enough for the nut to be fully tightened for the cotter pin to be fitted. Incidentally, an old wheel that has seen better days, and with the centre removed, fitted and lowered to the ground is ideal for securing the hub while giving the nut that final tightening heave. John McKay Scottish A7C Meshing Point June ‘09 with many thanks. How to remove a stubborn woodscrew, the slot for the screwdriver having been damaged? First centre-punch the centre of the slot and using a 1/16th drill and drill the screw until you have reached the bottom of the screw head. Successively increase the size of the drill drilling to the same depth until you reach the full size of the screw head. This will allow you to remove the item attached by the screw and leave a small stump which you can grip with a Molegrip with sharp teeth. Lock the Molegrip on and rotate the stump backwards and forwards carefully until you break the seal between it and the wood. The remainder of the screw should come out easily now - ‘Bumbling’ (A7OC) with many thanks. Did you know that the original Lucas headlights on a Ruby have a second inner metal silvered ring around the inside of the glass lens which the “w” shaped springs bear on to hold the glass in place? This has got a cork gasket between it and the glass which forms a seal to protect the silvering on the reflector from water. Some people have been known to assemble the lights with these items missing. “Bumbling” A7OC with many thanks. Overheating - Austin Seven. (From The Austin Magazine 1933) Q: I find that my 1928 Austin Seven seems to run hot, but there are no signs of boiling. I am wondering if you can give me your advice as to the cause. A: Overheating such as you are experiencing need not unduly alarm you unless, of course, you find that the engine boils when you get a long climb or much low gear work. Theoretically, so long as the water is not boiling, the hotter the engine runs the more efficient it is, providing that the over-heating is not due to some defect within the engine itself. Overheating arises from a number of causes. It may be that your ignition is too retarded so that the gases burn slowly and have contact with a bigger area of the cylinders than normally, thus taxing the cooling system. Again, if the mixture on which you are running is weak, there will be similar results due to slow combustion. There is also the possibility that your fan is slipping, due to the belt-tension needing adjustment, or perhaps the radiator has become choked with mud. The remedy in each of these instances is quite simple. 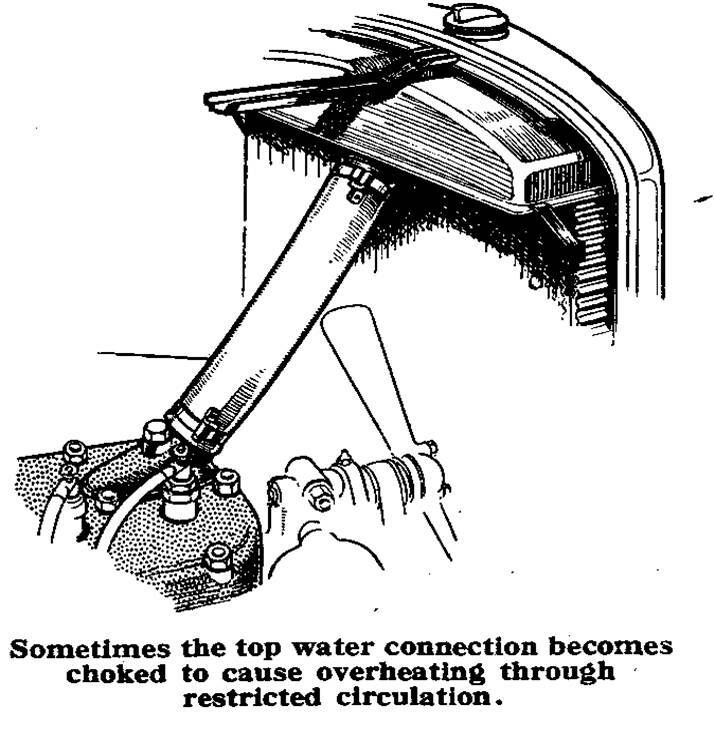 Another possibility is a choked water connection interfering with the circulation. If you find after a run that the temperature of the top of the radiator is markedly different from that at the bottom, you should remove the top hose connection and see whether it has frayed inside to restrict the circulation, in which event a new connection should be fitted. A The controls on your car are partly seized in the steering column and counteract any pedal movement you may make on the throttle. Disconnect the arm from the bottom of the column and test this. It is the only part that can have an effect on the carburettor. From the Practical Motorist Magazine. If you are having problems getting your core plugs to seal the following clever solution was offered to me the other day. Soak some strands of string in Hylotyte Red (replacement for Red Hermetite which is no longer available) and roll into a sausage shape. Clean the recess in the head thoroughly and allow it to dry. Line the inside edge of the recess with the wetted string where the new core plug will bear and fit the core plug in the normal manner. Tap it down with a suitable drift (suitable being about the same size as the plug) until the domed surface is flat. Leave for 24 hours before refilling or topping up engine with water. It should now be watertight. Hylotyte Red remains flexible and is easier to remove than Red Hermetite. “With many thanks to ‘Bumbling’ of the A7OC”. New petrol tap corks are available from Brit-Bits in Barrack Road, Christchurch. Before fitting them do not try and reduce the diameter even though they may appear to be too fat. First boil them in a saucepan for 10 minutes to make them pliable then fit them on to the spindle, smear a little Vaseline on to the cork and ease it into the body of the tap, it may be a little stiff at first but will soon ease up when in contact with the petrol. Glyn. Brit-Bits is open Wednesday to Saturday 9-1pm for callers, tel 01202 483675 and has moved to the rear of Smart Riders on 185a Barrack Road, Christchurch. The website www.britbits.co.uk gives an idea of the range of items stocked which can be sent by mail order. Crack detection – Austin 7 steering arm: I set about finding a crack detection kit remembering from my former life the large-scale use of Ardrox in the aerospace industry. Sure enough a kit was still available from Elmer Wallace Ltd., of Glasgow (http://www.elmerwallace.co.uk/). This consists of 3 aerosol cans: 1 of cleaner, 1 of penetrate dye and one of developer. I ordered the kit online (£30 + postage) and it arrived more or less by return post, so no complaints about the service. Now to use what I had bought. I removed the steering arm from ‘Jo’ pretty easily, remembering when to use the big copper headed hammer! Having done that I degreased and paint stripped it. The final preparation was to give it a complete clean with the supplied aerosol solvent. There were no visible cracks at this stage. Anyway, I then applied the dye and left it so soak in for about half an hour. After that, in accordance with the instructions, I cleaned off the excess dye and sprayed with the developer, which leaves a white chalky deposit on the surface. Slightly to my consternation, but perhaps not real surprise, a crack appeared clearly, as in the picture. Mike Johnston. This article has been taken from the Isle of Wight Newsletter with many thanks. A precautionary note regarding the fitting of the LED indicator bulb replacements. LEDs take much less current than filament bulbs so the contact surfaces within the trafficator arm need to be cleaned up to a bright metal finish as they need the full 6 Volts at the bulb in order for them to flash. Thanks to AutoBumbler, A7OC. THROTTLE ADJUSTMENT: Did you know the accelerator linkage – the bit that pushes the throttle flap open – is adjustable? It has a brass head on a threaded rod that can be screwed in and out (after removing the connecting ball joint). See Bob’s photos.Put a heavy weight or wife’s foot hard on the accelerator pedal and check to see if the throttle flap is wide open. If not, screw out the accelerator linkage until it is. The result? – instant performance. From an idea by Bob Kneale in the Cornwall A7C newsletter with many thanks. LED LIGHTS: Ron Hayhurst recently fitted LED lights to his Box Saloon - with splendid results. He bought them from Classic Dynamo and Regulator Conversions. See www.dynamoregulatorconversions.com where they show various options. From the BA7C newsletter with many thanks. TONNEAU COVER ZIPS I notice a few of us do fit a tonneau cover to their open A7s – some with a long zip down the centre. Whilst not very ‘original’, it’s extremely practical and very useful. The other day I was shopping in Ringwood with Rhubarb and struggling with a recalcitrant sticking zip when a very chap stopped by and reminded me a small drop of suitable lubricant would do the trick. Like you, the idea of greasing a zip hadn’t occurred to me. However, a small smear of Vaseline on the offending item worked wonders and the tonneau opens and closes as smoothly as silk. Many thanks to that passer-by. Probably works for zips in other places! Ian - Ed's Note: I have also rubbed an old candle down zips of coats and tonneaux with much success. OIL PUMP When you assemble your oil pump don't forget: radiused shoulders to the top, no gasket under the cover plate.